This image just reminded me that we have yet to pull out our ice cream maker and make homemade ice cream this summer. That might be a crime. 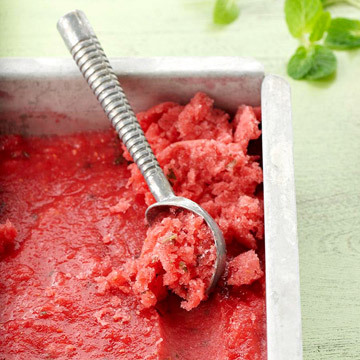 But if you are looking for a cool treat and don't have amachine, or if you just happen to have a lot of left over watermelon from the 4th of July, BHG has a recipe for Watermelon-Berry Sorbet, no machine required. I love watermelon, I love BHG, and I love that I found your site. Maria, I am glad you found my site too!! omg... i think my son would have a heart attack.